When products return, mark them as checked-in to tell Current RMS that those are back in your store. 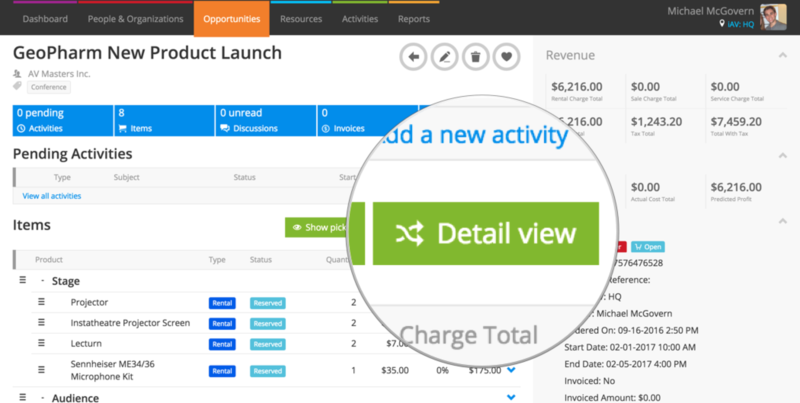 To check-in, head to the detail view on an order or project by hitting the green Detail view button. Use the check-in tab to check-in with a barcode scanner. Make sure that your cursor is in the asset field and start scanning. Current will check-in the serialized asset or barcoded product that you scan. If you don’t have a barcode scanner, you can type into the check-in field. Current will suggest asset and barcode numbers as you type. A barcode scanner can speed up warehouse operations, but you don’t need one to use Current RMS. Use the tickboxes next to items and the Action menu in the Functions tab to check-in your assets. 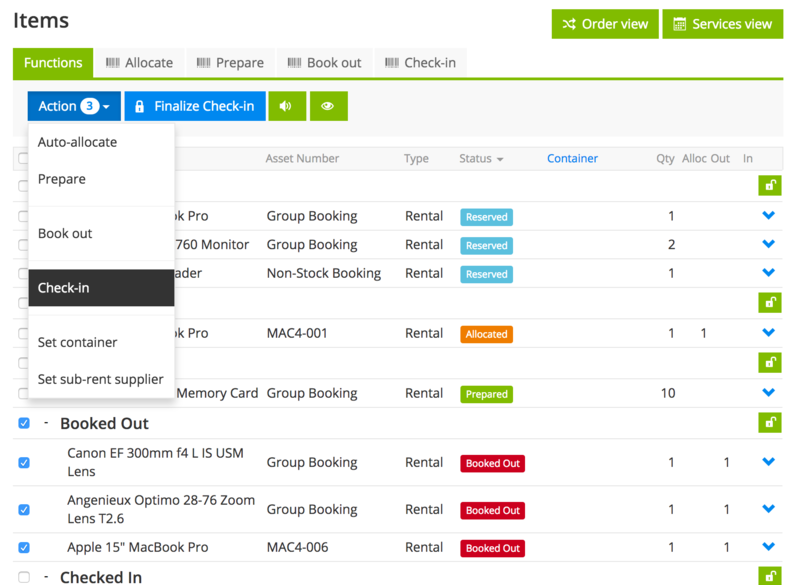 If you’re working with bulk or non-stock items, specifying a quantity on the check-in tab before typing or scanning an asset will check-in the quantity specified. You can also edit check-in details to adjust the “Quantity OK”. If an item is returned damaged or is lost, edit check-in details to tell Current RMS this. To edit check-in details, click the blue arrow to the right of a line and choose Check-in from the menu. 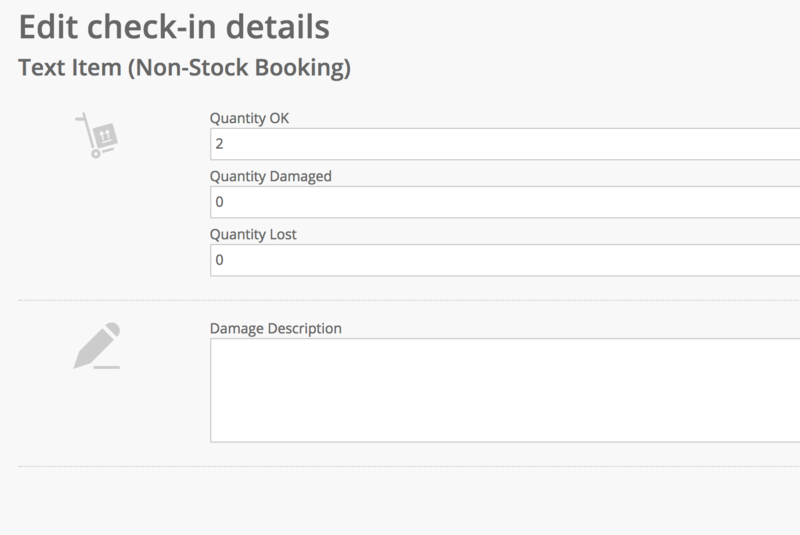 For bulk and non-stock items, you’ll see a screen that prompts you for quantities OK, damaged, and lost. Adjust these figures as you need. Quarantines are created for the quantities lost and damaged when you finalize check-in. 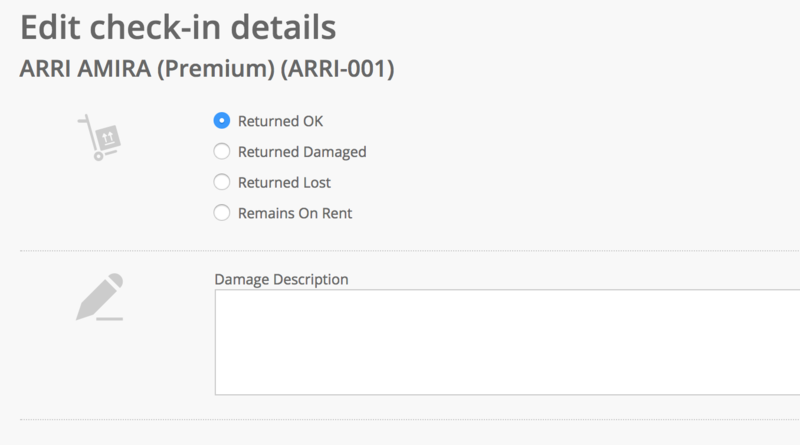 If items are damaged, you can enter a description of the damage that’s added to the quarantine created for the damages. Any items not accounted for are left booked out (i.e. they remain on rent). Serialized assets are singular so rather than entering quantities, you simply need to choose the correct radio button. The check-in process for sales items is your chance to tell Current RMS what happened to those sale items. When you check-in sales stock, you’re marking it as fully sold by default – not physically checking it back in to your store. Edit check-in for a sales item to mark it as returned. Returned sales stock moves to the quarantine as a sale return, where you can check it over before returning it to stock. Sale returns aren’t added to invoices raised after you’ve finialized check-in. If you’ve checked-in something in error, revert to the previous status by using the Revert Status option in the Action menu. If you allocate gear to an opportunity, Current can search for prior opportunities that gear was on and automatically check-in and finalize for you.